Michael Wolff's explosive, and controversial, insider account of the chaotic inner workings of the Trump White House. 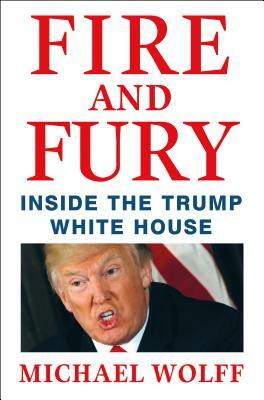 Marrying the slimy and carnivalesque, Fire and Fury occasionally reads like a parody of New Journalism with its elaborate scene-setting; omniscient narrator; some grand, misquoted Shakespeare; and a colorful vocabulary that swings from SAT words (apogee, persiflage) to bro slang (man crush, douchebag) ... Wolff prevents anyone from evaluating his reporting (as well as the motives of those giving him information), forcing us to trust him completely. But why should we be confident in Wolff's unsourced assertions when he makes so many small factual errors with information that is publicly available (even in spite of the fact-checkers he thanks in the acknowledgments)? ... So read it, sure — but as the commercials say, only 'as part of a balanced diet.' Much of the narrative is not substantively different from information found in other reporting on the president. But many other reporters have been restrained and careful where Wolff is shameless. Facts, Wolff appears to think, have done nothing to hurt Trump — so he is fighting spectacle with spectacle. The President of the United States is a deranged liar who surrounds himself with sycophants. He is also functionally illiterate and intellectually unsound. He is manifestly unfit for the job. Who knew? Everybody did. So why has a poorly written book containing this information, padded with much tedious detail, become an overnight sensation, a runaway best-seller, and the topic of every other political column, podcast, and dinner conversation? It seems we are in bigger trouble with reality perception than we might have realized ... tone, more than the substance, is what gives the book the flavor of a peek behind the curtain, the sense of someone finally putting words to an 'open secret' ... If the comedians bring reality into sharper focus, Wolff just slaps on broad, sloppy strokes. His writing is comically bad...His logic is ridiculous ... That Fire and Fury can occupy so much of the public-conversation space degrades our sense of reality further, while creating the illusion of affirming it. What did you think of Fire and Fury: Inside the Trump White House?